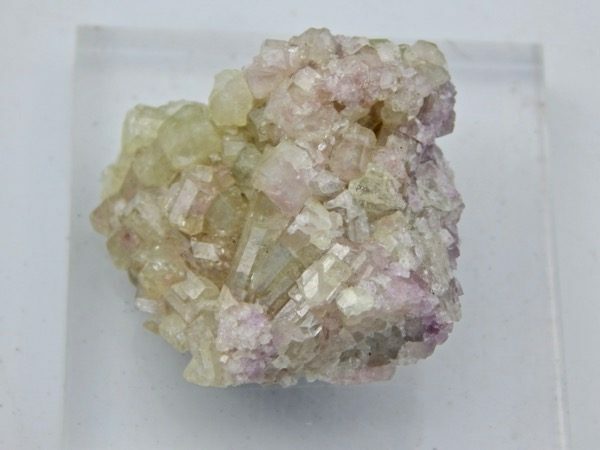 A bright and lustrous specimen of gemmy vesuvianite with some crystals having purple enclosed by a lighter green exterior. In very good condition. Classic vesuvianite, from the now-closed asbestos mine in Quebec. For sale is an bright and lustrous specimen of gemmy vesuvianite with some crystals having purple enclosed by a lighter green exterior. In very good condition. Classic vesuvianite, from the now-closed asbestos mine in Quebec. Since these were discovered about 20 years ago, the demand for the specimen with two colors has been intense, thus few are today seen in the market. It could be said that this location has produced the worlds finest versuvianite’s for both color and form! Please remember our prices are in Australian dollars. 31 x 29 x 17mm.